Audioengine W3 wireless audio adapter makes any system wireless | What Hi-Fi? Audioengine has announced its new W3 wireless audio adapter, a USB DAC and wireless system that can send music from a laptop, computer or other music source to any active speakers or stereo systems around your home. 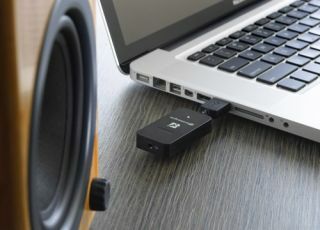 Consisting of a sender and a receiver, the former transmits audio from your computer through USB audio (or from any product with 3.5mm mini-jack or RCA audio outputs) to a receiver. The W3 receiver connects to any product with a mini-jack or RCA audio connectors – Audioengine's powered speakers, the A2 and A5+ would do the job. And hey presto, you have a wireless music system. The transmitter can also send music to up to three different receivers for a basic multiroom system. The upgraded W3 claims CD-quality stereo sound with no compression and can handle USB audio up to 16 bits/48KHz, as well as analogue audio via a 3.5mm mini-jack. Audioengine was one of the first companies to deliver such a product, launching the W1 wireless adapter a few years ago. The upgraded UK edition of the W3 also provides greater resistance to interference from other wi-fi devices – plus other ‘noisy’ devices around your home. Audioengine claims the W3 can transmit to devices over 30m away. The price of the Audioengine W3 is £125, which gives you a sender and a receiver. You can add extra receivers for £75 each.